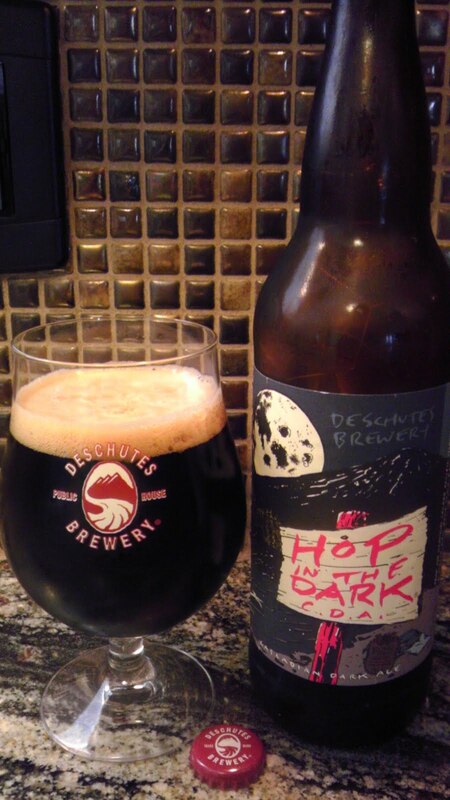 I made some new friends from Deschutes Brewery when they came to town for their Base Camp Week a couple of months ago and that friendship resulted in me receiving an early bottle of this year's release of Hop in the Dark. I've left it resting comfortably in my beer fridge, glancing at it occasionally while trying to determine when I should drink it. I finally decided Saturday night was the night. Hop in the Dark is their version of a Cascadian Dark Ale (or Black IPA or American-Style Black Ale or whatever you prefer to call it), a variant of the IPA made with roasted malts. I have to admit, I didn't really understand this style when I first heard about it. I just couldn't see how the roasted malt flavours and aromas would compliment the strong bitter hop flavours and floral aromas typical of the IPA style. And I was right, for the first few examples of the style that I tried anyway. However, as more breweries began experimenting with it, better and better versions of it were released. The Brewers Association recognized it as a style for the 2010 GABF and Barley Brown's Brew Pub in Baker City, OR took the very first gold handed out in the category. Big Rock Chip House and Brewery in Birmingham, MI won Silver and Stone got the bronze for their Sublimely Self-Righteous Ale. Greg Noonan (who passed away a couple of years ago) is widely credited for inventing the style at the Vermont Pub and Brewery in the early 1990's. As the name of the style and beer would imply, its a dark beer, very dark. Strong aromas of pine with roasted malts. The flavour mimics the aroma with the addition of a citrus hop presence mingling with caramel and dark coffee. Finishes dry with the taste of bitter chocolate. Its a very well executed example of the style and still one of the best I've had to date. I look forward to trying a few more new ones at the GABF this fall. Thanks to Deschutes for sending the bottle and I look forward to buying more of it when its available down here later this year.